When putting wood and having access to the fire, it is pretty convenient with the 17-inches front doors. The charcoal grate that goes with this model can be adjusted to different positions with the use of the crank handle. If you desire to have the slow cook it is highly advised that an average temperature of 250 degrees be observed. If the coals start to lighten, don’t forget to open the vent to keep the temperature. The exceptional features that come with this model of Landmann Charcoal Grill and Smoker will enable its users to optimize its use. It saves time and effort in a lot of ways. First, it is very simple to assemble and use and second, it allows you to do multiple cooking jobs at the same time. The design is just right. It makes this model so efficient and effective. To mention some, it includes the removable ash tray, the front doors for simple access in placing wood, and the lid and side door for straightforward entree to the charcoal box. The whole set is made from good quality materials so you can expect its strength and stability. 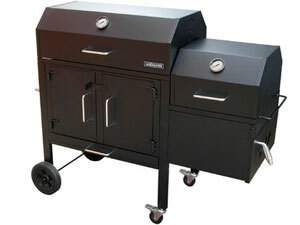 Common issues that were raised when using this model of charcoal grill starts with its assembly. It was said that it took a lot of time before the whole thing was built. The charcoal tray and the lids were observed to deform after it was exposed to great heat. The temperature of the primary griller does not heat up more than 275 degrees even though when the temperature of the smoker box was increased to 700 degrees. When there is too much exposure to heat after several use, rust develops both inside the cooking box and the in the firebox as well.